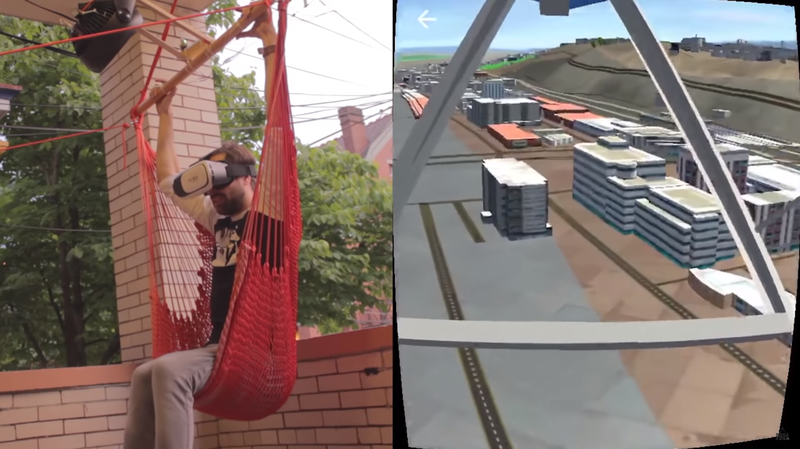 VR Hang Glider using a Hammock – and #Arduino, WRLD SDK in Unity, MPU-6050, ESP8266, and More! | #VR #virtualreality #HangGliding « Adafruit Industries – Makers, hackers, artists, designers and engineers! Check out the flyVR repo here on GitHub and the full project hosted here at Instructables. This project goes through converting a hammock into a VR flying machine. We will use a VR app that is running the WRLD SDK in Unity so you can input whatever GPS coordinates you want and fly around that area in VR! This VR app will also run on IOS or Android. The hammock has an ESP8266 running Arduino code that goes on the cross bar of the hammock so when you lean left or right you turn in the game. Also there is a small fan running another Arduino board that blows faster or slower based on your speed in the game. So this project will go over how to interface Arduino with Unity, wirelessly over WIFI and also how to control a variable speed fan. In this programming project we are going to build a flying machine in virtual reality using Arduino and Unity for the VR app with the WRLD SDK. This kind of thing is what got me into computer science, programming, software engineering whatever you want to call it, so I hope you like it!